Mt. Airy, NC (16 Oct 2002) - Andy Griffith was in town for dedication of the Andy Griffith Parkway. Seen with Andy are Ann Vaughn from the Visitors Center and Andy's lifelong friend Emmett Forrest. * Jan. 17: GEORGE LINDSEY performs at Gulf World in Panama City, Fla.
* Jan. 18: The Grand Ole Opry has announced that ANDY GRIFFITH will appear at the Opry on Saturday, January 18 for the 6:30 p.m. show. (His appearance is expected to be on the televised portion of the Opry that evening.) Among those scheduled to join Griffith are country artists and TAGSRWC members Marty Stuart, Clay Walker and many more! The Opry is being performed at the historic Ryman Auditorium in downtown Nashville through February 22. - Ticket to the Grand Ole Opry at its former home, the Ryman Auditorium, on January 18 with special performance by Andy Griffith (6:30 p.m. show only). Package accommodations at Gaylord Opryland Nashville: $205*; at Radisson Hotel at Opryland: $152*. For package reservations or tickets to the Grand Ole Opry, call 1-888-OPRY-872. Further information is also at www.opry.com. -- Rate is per person, plus tax, based on double occupancy. Extra nights available at prevailing rates. Premium View, add $50 plus tax per night. Mt. Airy, NC (16 Oct 2002) - Andy was able to spend the night in his boyhood home when he was in Mt. Airy for the Andy Griffith Parkway dedication. * Jan. 18: Mayberry Deputy David Browning leads toe-tapping at the Blue Ridge Jamboree in Mount Airy, N.C.
* Feb. 1: JAMES BEST appears at the Canton Cruise-O-Rama in Canton, Ohio, from 1:00 to 5:00 p.m.
* Feb.2: JAMES BEST rolls on over to the Hot Rod & Custom Auto-Rama at the Hara Arena Complex in Dayton, Ohio, from 1:00 to 5:00 p.m.
* Feb. 12-16: JAMES BEST appears at the Allegheny Outdoor Show in Pittsburgh, Penn. Times TBA. * Feb. 15: Mayberry Deputy David Browning fiddles around again at the Blue Ridge Jamboree in Mount Airy, N.C.
* Mar. 6: DON KNOTTS and Tim Conway perform in Mt. Pleasant, Mich.
* Mar. 9: RONNIE SCHELL performs with the Legends of TV Comedy at 7:00 p.m. at the Barbara Mann Center in Ft. Myers, Fla.
* Mar. 10: RONNIE SCHELL and the Legends of TV Comedy perform at 1:00 p.m. at Ruth Eckerd Hall in Clearwater, Fla.
* Mar. 11: RONNIE SCHELL and fellow TV Legends perform at 7:30 p.m. at the Coral Springs Center in Coral Springs, Fla.
* Mar. 12 and 13; RONNIE SCHELL and Co. perform at the Villages in Lady Lake, Fla. Two shows each night: 6:00 p.m. and 8:30 p.m.
* Mar. 15: GEORGE LINDSEY performs at Isleta Casino in Albuquerque, N.M.
* Mar. 15: RONNIE SCHELL and the TV Comedy Legends appear at Boca West in Boca Raton, Fla.
* Mar. 16: RONNIE SCHELL, et al, reign at the King Center in Melbourne, Fla. At 3:00 p.m.
* Apr. 5 and 6: Hollywood Collectors Show at the Beverly Garland Holiday Inn in North Hollywood, Calif. Stars TBA. * Apr. 11 and 12: RONNIE SCHELL hosts Veterans of Comedy Wars VI at San Francisco State University. Stars and times TBA. * Apr. 23-27: The 6th Annual George Lindsey TV and Film Festival at the Univ. of N. Alabama. For more information about entering a film or attending, go to www.lindseyfilmfest.com. * Apr. 24-26: JAMES BEST appears at the Virginia Film Festival in Roanoke, Va.
* June 13-15: MAYBERRY MEMORIES IN WORD AND SONG at the Jefferson Center in Roanoke, Va.. Stars and other specifics are to be announced soon. Watch the Event Calendar on www.tagsrwc.com for full info. For now, just be sure to mark your calendar. * June 20 and 21: Third Annual MAYBERRY SQUAD CAR NATIONALS and Mule Days in Brent, Ala. Stars and cars to be announced. * July 11 and 12: MAYBERRY IN THE MIDWEST 2 in New Castle, Ind. Favorite "tribute artists" David "Mayberry Deputy" Browning, Allan "Floyd" Newsome and Kenneth "Otis" Junkin are already confirmed. TAGS cast members and other details will be announced as they are confirmed. For updates, visit www.mayberryinthemidwest.com. * July 17: DON KNOTTS performs with Tim Conway in Mille Lacs, Wis.
* July 19: DON KNOTTS is in concert with Tim Conway in Fish Creek, Wis.
* Sept. 25-27: 14th Annual MAYBERRY DAYS in Mount Airy, N.C. For tickets (and its not too early to be getting them! ), call 1-800-286-6193. Visit www.surryarts.org for more information. Again, check the Events Calendar at www.tagsrwc.com for more information and updates. Aunt Bees Canton Palace Smyrna, Tenn.
"Now Youre Gonna Glenn Ford It All Over Town" Lafayette, Ind. "Move Over, Im Driving" Shawnee, Kans. "It Takes Brains to Survive" Pioneer, Tenn. If you are interested in starting a chapter of TAGSRWC, all you have to do is pick a name that has not already been chosen and submit a list of your founding members by postal mail to TAGSRWCs HQ at 9 Music Square South, PMB 146, Nashville TN 37203-3286. (You can find a list of names that are already taken online at http://www.tagsrwc.com.) Well then verify your chapter name choice and send you an official Chapter Charter. Or if you would like to join or contact an existing TAGSRWC chapter in your area, write to TAGSRWCs HQ and well help get you in touch. Mt. 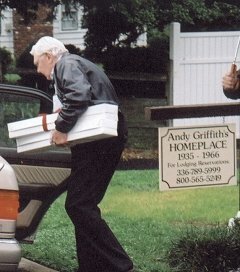 Airy, NC (16 Oct 2002) - Andy Griffith presented Emmett Forrest with the original door plaques from the courthouse doors as well as the stage door sign from the studio door! 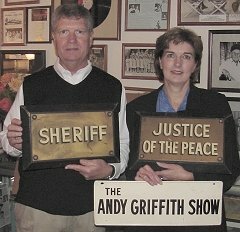 Neil and Pat Coleman from the Remembering Mayberry Chapter are seen here holding them at the Mt. Airy Visitors Center. Following his distinction of being the first person to drive a vehicle across the new Virginia Dare Memorial Bridge on the North Carolina coast in August and then participating in the momentous dedication of the Andy Griffith Parkway in Mount Airy in October, ANDY GRIFFITH continues to cause a stir among his fans. On Jan. 18, he will perform on the Grand Ole Opry in the historic Ryman Auditorium (see details in Upcoming Events above). the publication of his memoirs! Though Andy completed most of the writing for the book a decade ago, he has decided to go ahead and put the final spit and polish on the manuscript and have it published in September of 2003. (It goes without saying, of course, that TAGSRWC will offer copies through Weavers.) All fans of Andy Griffith are sure to find the book to be interesting reading. As this issue was being prepared, we also received word that Andy and wife Cindi were expected to be spending part of the holidays in Hawaii and were planning to see Jim Nabors while there. DON KNOTTS has had a restful holiday season following several concert dates with Tim Conway in November. More dates are planned for 2003 (see Upcoming Events above). Don is also scheduled to be at the Hollywood Collectors Show on Jan. 18 and 19 (see the info above). RON HOWARD is still cogitating on his next film project as director. Meanwhile, his Imagine Films is producing several movies for which Ron is serving as producer or executive producer. A biography of Ron titled "Ron HowardFrom Mayberry to the Moon" is set for publication in February (itll be available at Weavers). Though not an "authorized" biography, it is a loving tribute to him and his remarkable life and career. JIM NABORS hosted his annual "A Merry Christmas with Friends and Nabors" in early December in Honolulu and then enjoyed the holidays himself at his Hawaiian home with friends and family. GEORGE LINDSEY also enjoyed family visits for the holidays in Nashville. And about 20 friends helped him celebrate his December birthday as well. He has several performance dates coming up in January and February, plus his 6th Annual George Lindsey TV and Film Festival is set for April. THE DILLARDS (Rodney Dillard, Doug Dillard, Mitch Jayne, and Dean Webb) had a tremendous time playing together for a couple of shows in New Jersey and New York in late November. The New York date was extra special because it was at Carnegie Hall. The group performed a sold-out show with Arlo Guthrie and Pete Seeger in a celebration of the birthday of Arlos late father, Woody Guthrie. And on the heels of Rodney Dillards singing a newly extended version or "There Is a Time" on the Nitty Gritty Dirt Bands successful "Will the Circle Be Unbroken, Vol. 3" CD and the wildly successful Carnegie Hall concert, expect The Original Dillards to be making several tour stops in 2003, including at least two Mayberry events. BETTY LYNN spent the holidays with family in Missouri, but otherwise has been staying close to home in Los Angeles after a busy summer and fall at Mayberry events. Shes slated to appear at the Hollywood Collectors Show in North Hollywood on Jan. 18 and 19 (see the listing in Upcoming Events). JAMES BESTs Best Friends Films has been selected by Universal Studios as the film company that will handle all future promotional films for the park. To facilitate that assignment, Best Films has moved into new offices on the grounds of Universal Studios. James has recently redesigned his Web site as well. Check it out at www.jamesbest.com. RONNIE SCHELL has several dates (see above) booked for this spring. Theyre part of a comedy tour that hes been doing with Peter Marshall, Ruth Buzzi and Steve Landesberg. Ronnie also did a guest shot for the new Fox TV series "Lucky." Ronnies episode is tentatively scheduled for April. In recognition of his fund-raising contributions, Ronnie was also inducted in November into the Gator Athletic Hall of Fame at San Francisco State University, his alma mater. And in August, he was honored as Stand-up Comedy Legend for 2002 at San Franciscos annual Comedy Day celebration. With all that Ronnie has going on, he still finds time to serve as the Honorary Mayor of Encino, for which he begins serving his 14th year in 2003. As has now been widely reported in the media, PARLEY BAER passed away on November 22 in Woodland Hills, Calif., after suffering a stroke. He was 88. Parley was one of the most universally respected and liked people in Hollywood. Though his Mayberry character of Mayor Roy Stoner was a crusty politician and meddlesome bureaucrat who was crafted to be a source of irritation to Andy Taylor, Parley himself was completely the opposite. Parley Baer was a talented, jovial man whose career spanned everything from circus ringmaster to the heyday of radio (including the role of Chester on "Gunsmoke"). He stopped counting the number of radio shows he did once he reached 15,000! He appeared in more than 50 films from 1950 to 1995. His TV credits are extensive (he once estimated 1,600 to 1,700 TV appearances) as youll find for any character actor from the 1960s though the 1980s. Parley also had a whole career as a voice-over actor for animated works and about 350 commercials. Perhaps his best known character was Ernie, the Keebler Elf, which he originated decades ago and for whom continued to provide the voice until a stroke in the 1990s took his ability to speak. He also provided voices for the "Focus on the Family" radio show during his last working years. Though Parley Baer rarely made public appearances just for the sake of a public appearance (he was never able to attend any Mayberry events), he would make an exception for Old Time Radio conventions. Perhaps one of the greatest testimonies to the type of person Parley Baer was, was who his friends were. Perhaps his friend was Howard McNear, Mayberrys Floyd the Barber. They worked together in the radio "Gunsmoke" (Howard was Doc). Parley gave the main eulogy at Howards funeral. Another longtime, close friend was the late Hal Smith, Mayberrys Otis. Our condolences go to all of Parleys family for their loss. They surely can take comfort that he lived a wonderfully full life. And his many fans will continue to enjoy the results of his talents and efforts for generations. NOTE: You can read more about Parley Baer in a profile about him in Volume 11, Issue 2 (April 1995) of "The Bullet." Thats our news from the cast and crew for this issue. Well have more updates in the February "eBullet." You can find Mr. Weavers full lineup of items at www.tagsrwc.com/weavers. We also have our toll-free order line available for shopping convenience. The number is 1-877-943-9439. It operates Mon. Sat., 9 a.m.-7 p.m. CT. But you can also leave a message 24 hours a day and well call you back to get your order at a time convenient to you. * MAYBERRY MANIA TRIVIA BOARD GAME ($30.00) This brand new Mayberry trivia game was the hot Mayberry item for Christmas. (Youve probably seen it advertised regularly on TV Land.) It features an extremely attractive design and over 1,000 fun and challenging trivia questions. Its an entirely different format than the original "Andy Griffith Show" Trivia Game (also still available at Weavers). Casual fans and serious trivia buffs of all ages will enjoy this highly entertaining new board game. * ANDY GRIFFITH PARKWAY DEDICATION VIDEO ($20.00) An hour-long, professionally produced video of the dedication ceremony for the Andy Griffith Parkway in Mount Airy on October 16, 2002, is now available to order from Weavers. The tape features approximately a half an hour of comments by Andy Griffith. Its big! In fact its bigger than big. Andy Griffith called it "the biggest day of my life." See and hear it all for yourself. * MAYBERRY PENNANT ($7.00) This felt pennant in Mayberry orange lettering and blue background measures 9 x 24 x 24 inches. Perfect for showing your Mayberry pride at home or at work. * ANTIQUE-STYLE MAYBERRY DESK ALARM CLOCK $20.00 This handsome new desk clock features Andy, Barney, Opie and Gomer in a nostalgic copper-colored metal casing. The diameter of the clock face is 4 inches and the clock is over 2 inches thick. The clock features a sweep second hand and an alarm. A double-A battery is included. * MAYBERRY LUNCH BOX/THERMOS SALT & PEPPER SHAKER SET INSIDE MINI TIN BOX ($18.00) Just to make sure were clear: This is a collectible salt & pepper shaker set. The shakers just happen to look like a lunch box and Thermos. But to add to the confusion, the ceramic lunch box- and Thermos-shaped shakers come packaged inside their own collectible mini tin lunch box that measures 3 x 4 x 6 inches. The shakers themselves are about 3 inches tall. * MAYBERRY NECKTIES ($14.00 each) We offer stylish Mayberry neckties in two designs: A purple tie with Mayberry Deputy badges on it (the next best thing to that purple tie with acorns that Gomer once wore) and a forest green tie with Mayberry pennants and photos of Andy, Barney, Opie, Aunt Bee and Gomer on it. They may look like silk, but these ties are 100% polyester, so you dont have to worry so much about whether you spill. * MAYBERRY BASEBALL SCRIPT T-SHIRT ($15.00) The nostalgic baseball-style design says "Mayberry" in yellow-and blue script. Its available in sizes M, L, XL and 2XL. 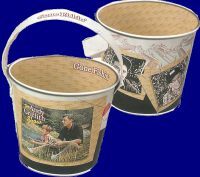 * MINI MAYBERRY TIN PAIL ($5.00) This new item is really fun. It measures almost 4 inches high and a little over 4 inches in diameter at the opening. It features a color photo of Andy and Opie fishing for Old Sam and photos of Gomer and Barney pioneering in "Back to Nature." Its a decorative, useful and nicely-priced new item. * MAYBERRY TIN STACKING CANISTER ($10.00) This cool new Mayberry canister stands at 6 inches tall and is 3 inches in diameter. It separates into three sections that can be re-stacked to make interesting patterns of Mayberry characters. Each of the three sections has its own bottom, and the whole canister also has a lid. Great for storing (or hiding) small items or to use as a decorative item or even as an easy puzzle. An outstanding collectible at a nice price. * "IM PROUD TO CALL YOU MY FRIEND" ($10.00) This is a book (new in 2002) of Mayberry dialogue and quotations that deal with Friendship. The book is 64 pages, 6 x 6 inches in size, colorfully designed and filled with photos of favorite Mayberry moments. The perfect gift for (or from!) a friend. * "ACT LIKE SOMEBODY" ($10.00) This is the companion book to "Im Proud to Call You My Friend." Its the same size and format, but the theme is Parenting and contains favorite moments of Andy instructing Opie (and vice versa). And Barney and others throw their two cents worth in as well. * "WILL THE CIRCLE BE UNBROKEN, VOL. 3" ($20.00) Spearheaded by the Nitty Gritty Dirt Band, this outstanding new Double CD release of 28 superb tunes by top folk, bluegrass and country music artists has one cut that will be of particular interest to Mayberry fans. Disc 2 includes "There is a Time," a favorite song performed three times on "The Andy Griffith Show." Written by Darling boys Mitch Jayne and Rodney Dillard, the track features vocals by Rodney and Ricky Skaggs. A bonus is that the version on this CD includes a brand new fourth verse that Mitch and Rodney wrote especially for this release! 1. For the two middle names or initials for Bernard Fife, any two of P., Milton and Oliver would work. 2. The most important crop in Mayberry is said to be the potato. 3. U.T. are said to be the first two initials for Dr. Pendyke (a.k.a. Barney Fife). 4. Millie once intentionally jams her thumb into a chocolate cake. 5. Portions of "Santa Lucia" are sung by the town choir, Gomer and Barney at various times when Barney and Gomer are being shuffled around by John Masters for the opportunity to sing the song in concert. Old Lady Crump might qualify a shrew with her tough questions in this issue. But though she does have some tough ones, she proves to have a heart with one or two. The deadline for entries to be postmarked to TAGSRWC, 9 Music Square South, PMB 146, Nashville TN 37203-3286, is February 15, 2003. The winner will be announced in the March 2003 issue of "The Pocket" and the May issue of "The eBullet" and gets a choice of any item from "The Pocket" or online at Weavers, except for the Mayberry Squad Car Cookie Jar and items in the Collectibles section. Good luck! 1. In Mayberry, what is Stan Musials lifetime batting average said to be? 2. What "literary figure" is said in Mayberry to be a hygiene instructor? 3. What is 2 plus 2 said to equal in Mayberry? 4. If you were to contact somebody with number 38216 in or near Mayberry, whom would most likely have reached? 5. Who in Mayberry believes his or her eyes are "sort of an azure"? BONUS: Besides this question, how many questions in this quiz have you answered correctly? NASHVILLE, TN (11 Dec 2002) - Fans from all over and as far away as Canada and Nebraska traveled to Nashville to celebrate George Lindsey's birthday. George (second from left seated) was given such wonderful gifts as a giant rubber rat and a dog with its head buried in the ground. 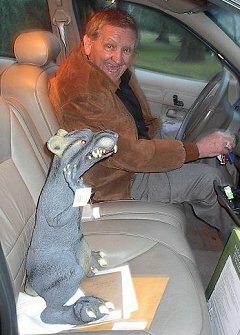 Below the rat rides shotgun as George heads for home. 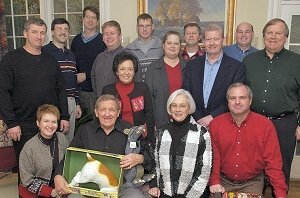 Many TAGSRWC chapters had holiday celebrations. Among the most long-standing and well-attended is Barney chapters gathering in Greensboro, N.C. In the Johnson home filled with Mayberry décor (including a tree with nothing but Mayberry-themed ornaments! ), the group enjoyed good food, Mayberry songs and trivia, and an exchange of whimsical Mayberry-related gifts. Mayberry chapter (Knoxville, Tenn.) also gathered during the holidays and participated in area parades with member Michael Lowerys squad car replica and members who dressed as Mayberry characters. Their deluxe chapter newsletter has another issue coming out in January. Theyre also gathering to celebrate Maggie Mancusos birthday in January and Jean Carsons in February. And a contingent is planning to see Andy Griffith at the Grand Ole Opry on Jan. 18th. You can also keep up with details of this active chapters news and goings-on at www.mayberrychapter.com. Our long-distance driving award for a chapter in recent months has got to go "I Was a Pawn in the Hands of Wily Woman" of Plainview, Nebr. Not only did they drive to Mount Airy for Mayberry Days, but they drove back three weeks later for the dedication of the Andy Griffith Parkway. They were back behind the wheel to meet up with a small group of fans in Nashville in mid-December, and theyre driving back to Nashville to see Andy Griffith at the Opry in January. Its just a good thing that water and air are free! Mayberry Troop #44 chapter (Clear Lake, Wis.) is seeing clear progress on their construction of a full-scale replica of the Taylor home (with Wallys garage tacked on the back!). Theyve got it all enclosed for the winter and are now concentrating on the interior work. By springtime, they expect to have the vast majority of the work done and likely will be able to move in. "Barneys One-Bullet Volunteers" (Morristown, Tenn.) checked in to report that they regretted missing several Mayberry events this year, but their active involvement with community work in their town has kept them close to home. But they have been participating in a local Mayberry Bible study group and are planning to serve as tour guides for a spring trip to Mount Airy by a group of senior citizens from their area. The Mayberry Liberation Organization (MLO) has moved its base camp from Indiana to Charlottesville, Va. Theyre excited because their new location puts them closer to Mount Airy and Mayberry Days (which they attended this year), though they are now farther from New Castle, Ind., and its Mayberry in the Midwest event. Jeff Koontz of "Some of Us Got It, Some of Us Aint" (Clayton, N.C.) recently represented his chapter in a trip to Los Angeles Franklin Reservoir, site of most of the lake scenes on TAGS, including the opening credits. With the help of cooperative cellphone towers and Sarah, Jeff was able to make calls from the lake to some of his chapter members and others. Members of Wallys Front Porch (Wilson, N.C.) say they are having great fun at their well-attended monthly meetings, which are held in member George Boyds replica of Wallys Service Station. Those are a few of the highlights from recent chapter activities. Many chapters have checked in during the holidays and have reported that theyre doing well and looking forward to a new year that, in addition to regular chapter activities, already is shaping up with several confirmed events featuring favorite Mayberry stars. Footnote: Chapter leaders should expect to receive their annual "State of Mayberry" letter from TAGSRWC HQ in the mail around mid-February. * TV Land has indicated that it desires to erect a statue in tribute to "The Andy Griffith Show" somewhere in North Carolina. Theyve actually been talking about it for three or four years. The apparent decision to put the statue of Andy and Opie walking to the fishin hole somewhere in Raleigh recently received a lot press, especially in North Carolina. Lots of eyebrows and questions were raised about why such a statue wouldnt be placed in Mount Airy, Andy Griffiths hometown and the place that Andy himself recently has strongly hinted (if not outright stated) was a significant part of the inspiration and basis for Mayberry. While Raleigh is the state capital, it also represents on TAGS much of the big-city hustle and bustle that is the antithesis of Mayberry. Barney may have yearned for the action of Raleigh, but Andy and Opie seem more at home to many fans in a place like Mount Airy. Stay tuned to see this discussion continue to take shape. * Catch a glimpse of Denver Pyle if you can in a film clip used in the hit movie "Catch Me If You Can" that's currently in theaters. And if you like to receive Mayberry information on good, old-fashioned paper, we have a publication called "The Pocket." Its an eight-page newsletter that contains highlights from "The eBullet" and the "Weavers Newsletter." Since "The Pocket" involves printing and postage, there is a fee to receive it. "The Pocket" will continue with additional issues for 2003 and 2004. There are several subscription options for brand new subscribers. All current subscriptions to "The Pocket" expired with the November 2002 issue. Renewals for all subscribers can be done online right now at http://www.iMayberry.com/tagsrwc/weavers/thebullet.htm and through the renewal form in the current (November 2002) issue of "The Pocket." Or you can receive for a free sample issue by writing TAGSRWC, 9 Music Square South, PMB 146, Nashville TN 37203-3286 and sign up with the form provided. The next issue of "The Pocket" is scheduled for publication in March 2003. TAGSRWCs other main vehicle for Mayberry information is simply our Web site at www.tagsrwc.com. It has extensive content and links for just about everything a Mayberry fan might be looking for. The next issue of "The eBullet" is scheduled for February. Meanwhile, Best Wishes for a Happy New Year!